With mere days to go before the Grand Départ of the Tour de France, the excitement in England surrounding the Grande Boucle is already palpable. Stretching along the whole route from Yorkshire to Cambridge, momentum is steadily building. 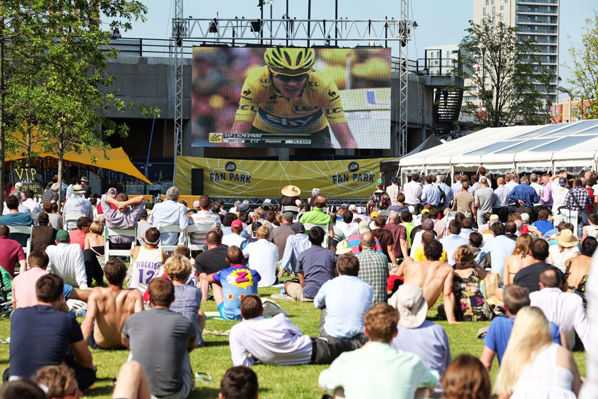 In London and Harrogate, the four Fan Parks are busily preparing for fans of the Tour and the world of cycling to descend upon them in their droves. With a range of activities on offer and big screens set up especially for the occasion, they will be at the heart of the action from July 3rd-7th and then during the final four stages. Whilst the British Fan Parks will allow fans to follow all of the day’s action live as it happens, visitors will also be able to enjoy several fringe events hosted by the event’s partners. Alongside bars, restaurants and rows of stands dedicated to cycling (and France!) visitors will be offered the opportunity to seek health and fitness advice or even a free health check from the experts from Nuffield Health, the presenting partner of the Tour de France Fan Parks, also take their place in history in the race director’s iconic red SKODA, or visit the Ibis “Fun Space” which has activities for the young …and young at heart. As sites of future British Tour festivities, the Fan Parks will also see appearances by renowned sporting personalities. Serge Betsen, former rugby international, will be swapping the oval ball for two wheels and organising a spin bike challenge with his foundation which will see players from the four main London clubs (Saracens, London Irish, Harlequins and London Wasps) competing at the Green Park Fan Park on July 7th. Three days earlier Monsieur Paris-Nice himself, Irish cyclist Sean Kelly, will also be dropping in to give an exclusive masterclass in Harrogate. And because the race doesn’t end at the finish line, the Tour’s flame will also be lighting up the British night sky. The Fan Parks will have events carrying on well into the evening with concerts in Trafalgar Square and the documentary Rising from Ashes being shown at the Green Park and Harrogate sites to keep the party going until the next day’s stage. While Chris Froome and Mark Cavendish put the finishing touches to their physical preparations in the run up to the event, people from across the whole country are certainly entering into the spirit of the Tour de France. This July, from the Tour’s roads to the Fan Parks, prepare for the whole nation to have a distinctly French flavour to it.